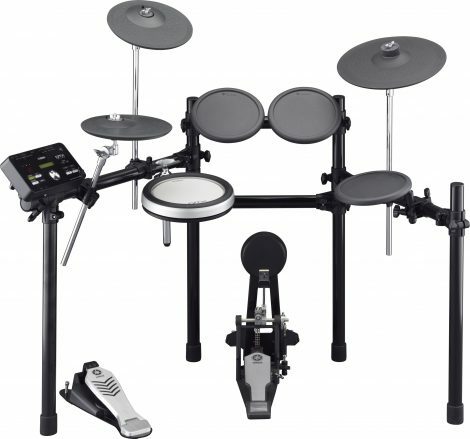 Electronic drum sets sound great in a variety of music genres. This list contains some of the best electric drums on the market today. They offer the affordability and quality percussionists want while providing a great sound and practical use. 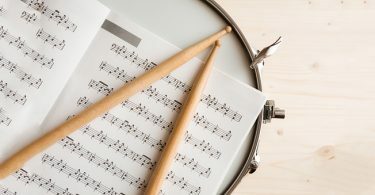 After reviewing 20 plus options here are the best electric drums with the best features and sounds. You will be proud to own and use the following drums, no matter what type of music you play. All-black set-up, easy-to-use interface, aound library, durable stand w/ quick set-up, natural swing with CY-5 cymbal pad, realistic sound, and kick pad with great response and playability. 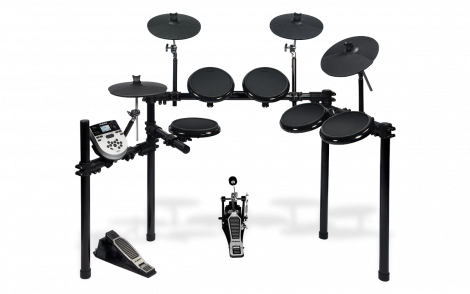 The Roland Compact is the type of electronic drum set any professional drummer would feel comfortable playing. It offers multiple features that make it worth its weight in the going price. 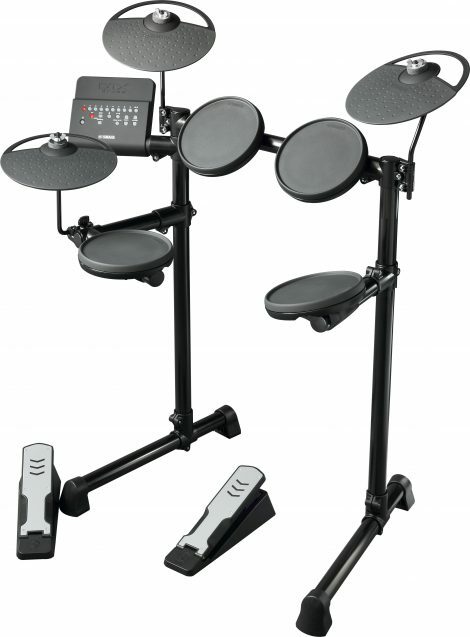 Another attractive feature in this electronic drum kit is its appearance. It’s sleek and black with an easy-to-play and attractive layout. What makes some drummers shy away from using electronic sets is often how toy-like they can feel. 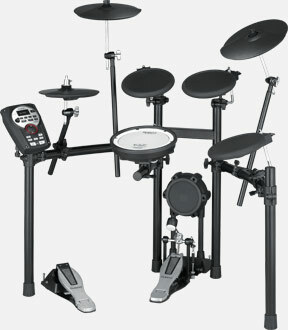 However, the Roland TD-11K-S V-Compact lives up to the standard experienced musicians want. 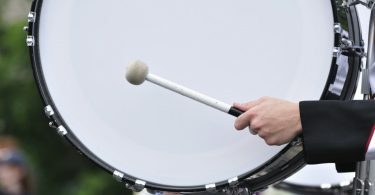 This drum also has mesh pads for the snares to give it a great sound and fantastic playing. While providing realistic sounds and smooth functionality, this is a compact set that can fit into a small room or stage. With so many fancy features, you may think the Compact would be difficult to use, but it offers a relatively easy set-up and its interface is not difficult to understand. What most experienced drummers would love is the ability to be able to adjust sounds, hi-hats and kits. 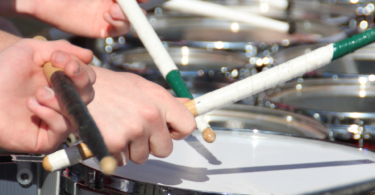 Many percussionists find this drum amazingly responsive. 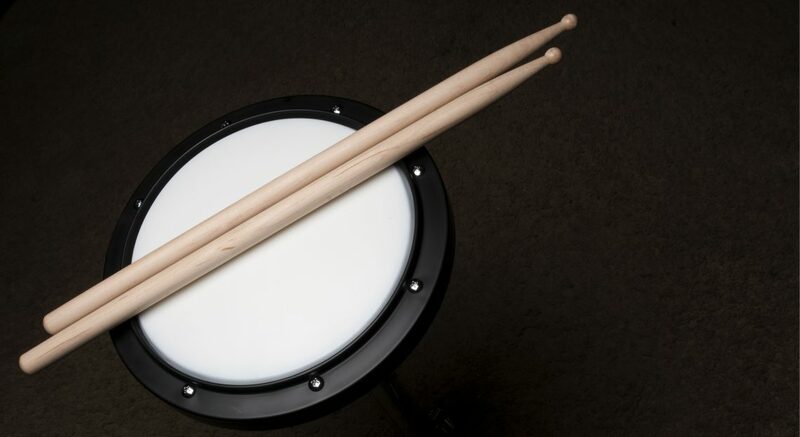 The snare is great for sounds, including rim shots, making this the best electric drum. There are other kits out there at lower prices but they don’t offer the same features as this drum set. They make it an easy-to-use, accessible and durable set many drummers would be willing to pay a bit extra for what it offers. In the end, the high quality wins over any other drum set around at the moment, making it the top pick. A mesh-head V-pad for snare and toms that provides drummers with a smoother feel. V-compact sound modules with SuperNATURAL that provide quality sound and preset kits. Acclaimed V-cymbals that are highly responsive and sound great for an electronic drum kit. Natural feel kick pad and a custom stand. Hi-hat combination, giving it that realistic open and close feel one would experience in an acoustic set. USB thumb drive to add any tracks and loops you like. 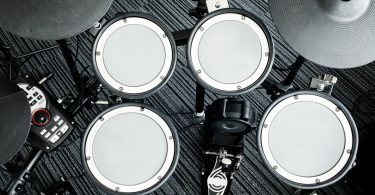 While many drummers enjoy playing on an acoustic drum set, many percussionists appreciate the ability to pack up and go with a compact, portable electronic drum set. Yet the cherry on top for a drummer is when electronic cymbals play with the sound of an acoustic set. Any drummer who has spent their life playing on an acoustic who switches to an electronic wants it to sound and play the same. That is what makes the Roland TD-11K-S V-Compact a top pick for many drummers. With it, you can have your cake and eat it, too. A great interface that is easy-to-use. Sound library that provides players with sound kits and ambiance effects. Custom stand for durability and a quick set-up. A natural swing movement with CY-5 cymbal pad. Kick pad with great response and playability. It’s pricey at approximately $1,000 to $1,600. The sound module can be tricky for some people to use. It has some features drummers may want to upgrade, resulting in extra costs. Not everyone is willing to pay big bucks for an electronic drum set, especially those who are just starting out. Among the lower-priced options, the runner-up would have to be the Alesis DM7X. It offers players the quality they are looking for at an affordable price. It’s also compact, offers great kit sounds, and is easy to set up for any home studio musician. The Alesis DM7X will go anywhere with you. While this drum set doesn’t reach the favorite status as the Roland TD-11K-S V-Compact does, it can still fit in a variety of spaces. For many percussionists who choose to switch from an acoustic set to an electronic one, it is due to lack of space. This factor helps the Alesis DM7X stand out. 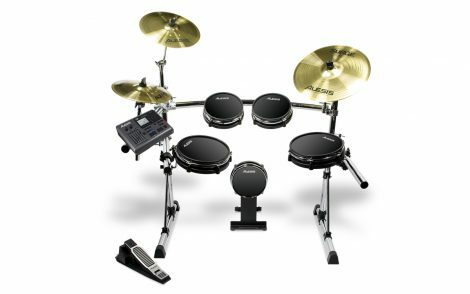 The Alesis DM7X boasts of having a six-piece 4-cymbal kit, a DM7X Module with 40 kits and 385 sounds, and four 10″ cymbals with crash cymbal chokes. It doesn’t have as many features as the top pick, but the price makes it a friendlier buy at around $375. If you are looking for an affordable purchase that offers a compact size and usability, it is an attractive buy. You get a good quality drum for its price. It includes quality materials in the snare. It comes with a USB MIDI connection for home studio use. You can make impressive snare sounds. It offers crisp track sounds. The customer support is impressive to customers. The DM7X has a highly sensitive hi-hat pedal, making it easy to accidentally trigger an open sound. Also, it is not the most durable set around, so it is not the best electric drum set you can buy. The Medeli DD402 offers both quality and affordability at only $119. This makes it the best electric drum set for percussionists who want something compact to practice on in their homes. It also works for someone who is just learning to play and may not have the budget for a state-of-the-art kit. With this drum, you will be able to get a great drum sound. The DD402 is more affordable than the Roland TD-11K-S V-Compact. However, it doesn’t come with as many features. It also may not be the best set for live shows. But this is a smart buy for those who need something to play their music on while at home or in a small space. Be sure to determine what you are buying your drum set for before you purchase it, though. Drummers who want an electronic cymbal set to use for shows may find the Medeli DD402 is not the best option for that purpose. A USB Port and MIDI Out. Responsive hat and bass pedals, drum and cymbal triggers. The Medeli DD402 is a couple of downsides. First, it is not a multiple feature drum kit. Second, it is not the best drum set for professional performances. Aside from the top three picks, here are some other drums that may interest you as well. 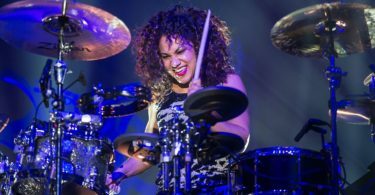 Although they are not the best electric drum set available, each has its own set of pros and cons. The Yamaha DTX400K provides a nice sound for the price of approximately $400. It has responsive triggers and an impressive selection of sounds for those who like to play with tracks. While it comes with a small snare, the sound performs well. What’s a big plus with this drum set is that it is sturdy because Yamaha made it from quality materials. Some drummers consider it to be on the small side, which may get in the way of drumming comfortably. But this same small size helps it to fit anywhere, making it ideal for home studios or places where space is tight. Affordable for the level of quality it offers. Small and difficult to adjust. Poor in its hi-hat ability. As with most Roland products, this drum set offers percussionists the quality they want when spending money on an electronic drum set. Some of the attractive features on this one are the mesh heads that offer incredible rebounds, the easy mobility of the compact size, and the hi-hat pedal. 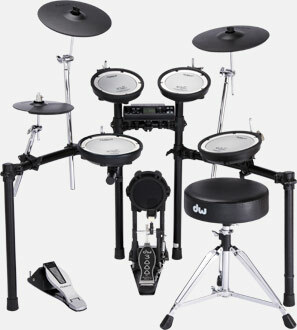 It also has kits, which as many drummers know, is a big plus when buying an electronic drum set. This one goes for about $1,000 or more. The Roland TD-4KX2-S is costly and has an overly-sensitive bass drum pad. 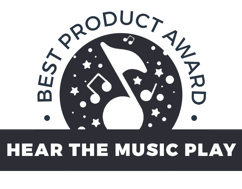 The first thing you should know about the Yamaha DTXplorer is, if you are looking for a professional kit to take on tour or play acoustic drum sounding music, this isn’t it. But, that doesn’t mean that it isn’t an affordable set for someone who wants a high quality kit to play on or practice with at home or in the studio. Practical pricing at around $580. Works well for practice and as a starter kit. The DTXplorer has noisy pads and poor hi-hat pedal functionality. 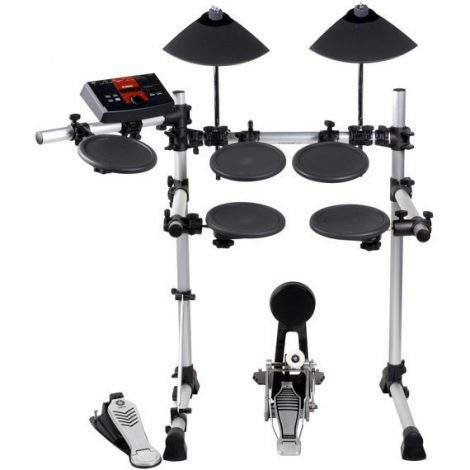 Among the more affordable electronic drum sets is the Alesis DM10Pro. It offers players the ability to use it anywhere as it fits into small spaces. This drum kit also includes features those with home studios appreciate, like the ability to set it up with their audio interface and record. It also has lots of sound options and the mesh heads offer quiet yet ease of usage. Drummers looking for something that offers reliability for a reasonable price will like that it doesn’t usually price higher than the $700. mark. A choice of sound modules. At around $800, the Yamaha isn’t the most affordable drum set around, yet it isn’t the priciest, either. The accessible pricing makes it a favorite for people looking for quality but don’t want to spend more than $1,000. 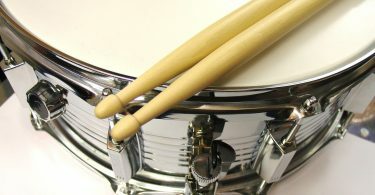 It offers drummers 10 base kits providing several music genres. This is attractive for experienced percussionists. The cymbal triggers can detect the strength of your hit, so drummers can play light when they want to and heavy, as well. A high quality sound and performance. Some cons of the DTX522K include the fact that it doesn’t always come with a power adapter. It is also small in size and the hi-hat pedal isn’t the best you can get. These are the best electric drum kits available today. If you want to enjoy the sound of an electric drum set, choose one of these for your home studio or to take on the road.